A Brilliant IKEA ad that goes beyond its internet marketing or adverting value as it gently startles the reader to re-live the experience. 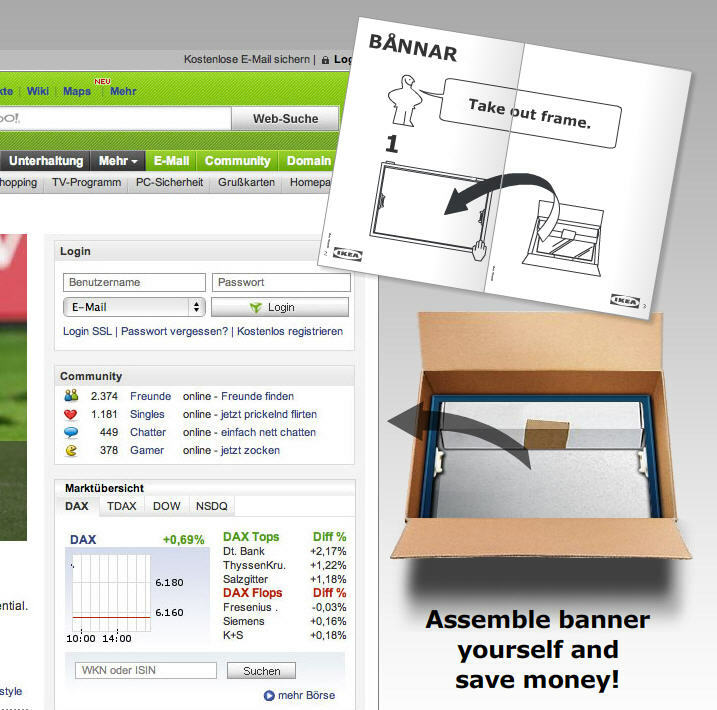 This interactive banner ad offers us a simple blueprint for great TransMedia or Cross Media campaigns where future customers are offered guidance to assemble unique story elements found in different places or spaces according to their CURRENT needs rather than values targeted by marketers and advertisers. X-Media campaigns have great promise at a time where the value of SEO is rapidly declining and search is being displaced by Social Media for finding or refining questions or answers. Self-assembly of stories is the core value we offer to our clients and we use our SpeedSynch Resonance Maps to help customers align their current or future needs to the content, products or processes. We welcome you to join us and explore this with us. Applying ROI to Marketing is occassionally treacherous as it often creates a debate about what may be measured and what is ‘soft’ or ‘just a guess. In my experience I have found that ROI calculations are based on political choices related to formulaes and time whether the project is related to building a new factory, buying new bottling equipment, justifying a new computer hardware server or marketing. Deep dig enough and it is all ‘soft’, precise as it may appear. Now lets get to Marketing ROI. B2B ROI is different that B2C ROI because of the behaviours of the prospects or customers that buy products from businesses. Business people buy products to consume though most of their expenditures are embedded into their products or services for re-sale, hence the distinction B2B. B2B buyers or the decision makers that decide what to buy and when act differently so our meausres of ROI must be different. Marketers must spend money differently on identifying customer or prospect behaviours and delivering messages to support the sales of products or services to B2B buyers. Prediction Marketing, all the current rage, is not based on ‘past’ behaviour but rather our ability to predict future behaviour which simply means understanding where are our prospects or customes going rather thant where have they gone in the past. We use a combination of Predictive Marketing and determine the ROI values important to our customers or prospects to determine where they are going so that we know how and where to deliver our value propositions. Contact us to see how SpeedSynch Resonance Maps and Predictive Marketing can help you. Success appears to grace fast learners able to assess their current state of affairs to determine how to focus resources, skills, time and attention to opportunities that Resonate to their brands and products. From a commercial perspective market and business success may depend on how quickly your customers learn and innovate and if you can help your customers do both faster, then you will also succeed. Fast learning requires content to be delivered to people so that they understand how products help them work faster or get more value from their current effort. Twitter is one of the few successful Social Media platforms where content, trust and relationships can be manged by community members very simply by following and Re-Tweeting. The ability to access content is important to success and even more value may be created by finding the right content to speed up learning. Success in business is most often confused with precision, formulas and plans though it appears that after you plan life, life just happens. This is why the concept of risk reduction is important in the business world where a business may not survive if it goes one way and its customers go another. Branding and advertising help reduce the business exposure to risk though both are one way models that sends stories to customers across media channels used and trusted less every day. The loss of trust in traditional media sponsored by corporations or product sellers is evident in the rise of Social Media communities and comes at the expense of older media channels, corporate web sites and Search Engines that serve them. Constant changes in the needs of people, commoditization of products and seemingly unlimited content available create a demand for faster learning and an imperative for business to adjust quickly to changing customer need. · Map the ‘Resonance’ of people, products and content across markets. · Shape stories from suppliers or competitors so customers learn faster. · Deliver stories across spaces and places used by customers. Contact us to see how SpeedSynch Resonance Maps can help you understand how customer change impacts your business operations or investments in innovation, learning or infrastructure.